"With its emphasis on measurement and implementation, this book covers areas that are too often neglected and makes a useful and practical contribution." When an organization wants to gain and maintain a competitive advantage, it is essential that they provide the right sales training to the right sales people at the right time. 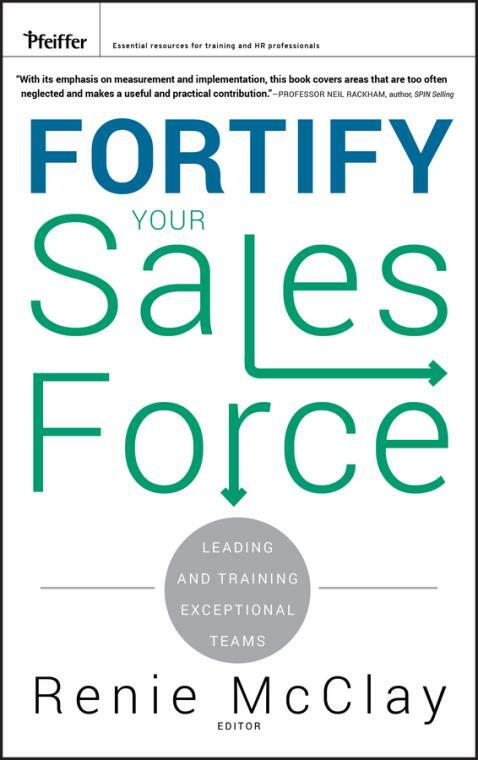 Fortify Your Sales Force is a hands–on resource for any organization that wants to increase profitability and thrive in today′s highly competitive marketplace. The book is filled with the real–life experiences from more than a dozen seasoned sales training professionals who have worked with a range of Fortune 500 companies that represent a wide variety of industries. These experts clearly define successful methods for leading and training an effective sales force in this era of limited resources and cut budgets. They offer the proven tools for any company that wants to increase the effectiveness of their sales force. The book gives a behind–the–scenes look at training experiences from leading companies such as Motorola, Proctor & Gamble, Kraft, Ricoh, United Airlines, and RR Donnelly. Based on their real–life experiences, the contributors reveal how to get internal support and funding of training initiatives, how to choose the right solution, the role leadership plays in successful training, and offer information on how to assess the competencies and needs of the sales force. Fortify Your Sales Force shows what it takes to make certain the customer is the primary focus for your sales force. For sales managers, there are tips for onboarding new sales people into the organization, leading virtual sales teams, reinforcing training to make it stick, and planning effective sales meetings. For sales people, there are a self–assessment and ideas on how to use emerging technology to sell. In addition, the book offers critical information on how to determine the impact of training, and what it takes to survive in a down economy. Chapter 1 Invest in Your Salespeople Now (Bob Rickert). Chapter 2 Winning Leadership Support of Sales Initiatives (Jim Graham). Chapter 3 The Perfect Salesperson: A Guide to Building Your Dream Team (Teresa Hiatt). Chapter 4 Develop Sales Reps Using Structured Feedback (Kenneth R. Phillips). Chapter 5 So Many Choices: Determining the Right Solution (Mike Rockelmann). Chapter 7 Making Training Stick: Get Them to Use it (Susan Onaitis). Chapter 8 Measuring the Impact: Did They Use it (Gary Summy)? Chapter 9 Collaborative Partnership to Maximize Your L&D Investment (Susanne Conrad). Chapter 10 Sales Managers: The Heavy Lifters in Training Salespeople (Rick Wills). Chapter 11 Productive New Hires, Faster: You Don t Get a Second Chance to Make a First Impression (Renie McClay). Chapter 12 Raise the Roof Sales Meetings (Lanie Jordan). Chapter 13 Successfully Leading Virtual Sales Teams (Renie McClay). Chapter 14 Media Mojo: Using Technology as a Survival Strategy (Trish Uhl).